For most of her life St. Josephine Bakhita was a slave and was sold several times, often to very abusive "masters". In December, 1893 St. Josephine Bakhita entered the novitiate of the Canossian Sisters and and took her vows three years later. During her life as a Canossian Sister, St. Josephine Bakhita was well known in her community and those around her felt protected by her. A young student once asked Bakhita: "What would you do, if you were to meet your captors?" Without hesitation she responded: "If I were to meet those who kidnapped me, and even those who tortured me, I would kneel and kiss their hands. For, if these things had not happened, I would not have been a Christian and a religious today"
St. Josephine Bakhita died on on February 8, 1947. On May 17, 1992, she was declared Blessed and given February 8 as her feast day. 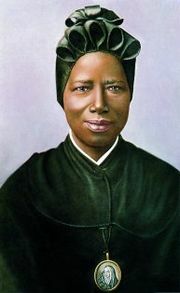 On October 1, 2000, she was canonised as St. Josephine Bakhita.